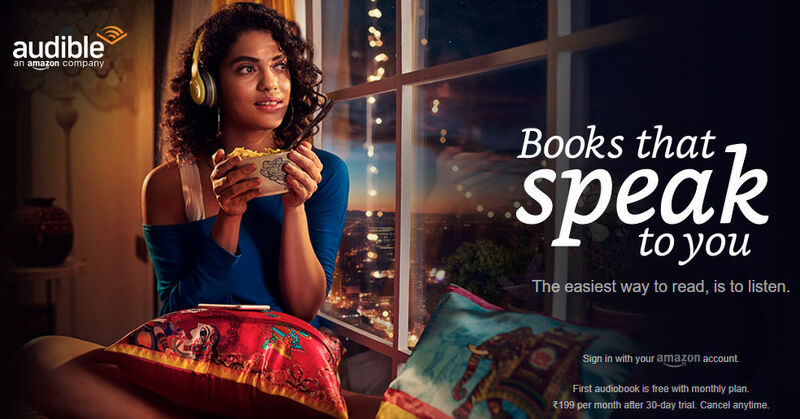 Amazon has finally launched its Audible service in India. This lets you listen to your favourite books using the Audible app. The company says that it has over 200,000 audiobooks narrated by performers across several genres. The company says that the service is currently in beta and it is still adding more new and exciting Indian and international audiobooks every day. Audible subscription costs Rs. 199 per month after a 30-day trial as well as one free audiobook. You can cancel the subscription anytime. Select users get 90-day free trial along with a credit towards three free audiobooks. For Indian users, it is offering 1 credit a month that lets you use it on any audiobook regardless of the price. You can roll over up to six unused credits to the next months. Once you subscribe, you get to keep the audiobooks in your Audible library, even if you cancel the membership. You can also swap the books if you don’t like it. Apart from the base subscription, you also have a 6-month and 12-month plan priced at Rs 1,345 and Rs 2,332 respectively. The company says that it is offering 30% off on additional saving on audiobooks for exclusive members. You can signup for Audible using you existing Amazon account by heading to audible.in. We can expect it come out of the beta and launch officially in the coming weeks.